I have a 55 gal. reef tank with a Bubble Coral and Duncan coral. 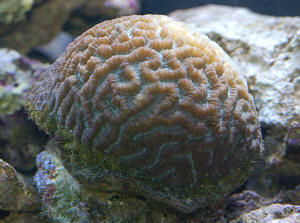 I would love to add a "Maze Brain Coral" being sold as "Platygyra spp." What light would it need to do well? I have 4 65 watt power compacts over the tank and the rock is about 10 inches below the surface at its highest point. Would this even be compatible in my system? I do not have a means of quarantine for very long, because I have no reef light over my qt tank (10 gal). Can you give me a specific link to the exact page on your site for this species? My feeble attempt to locate it ended in failure. 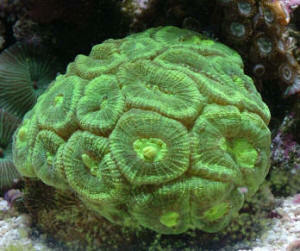 Is this a coral you would say has a dismal mortality rate? I really don't want to get this without some back ground knowledge. Thanks! And, I truly hope your week goes well! Candy cane coral care god love IPSF.com, but their freebies freak me out! I got a free candy cane frag with a shipment. I have no experience keeping corals. 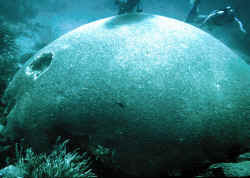 << Well they are certainly easier to keep than fish. >> I can't keep it in the main tank due to my Toby. I am currently keeping it in my 10 g. refugium. It has amphipods and macroalgae, hermit crabs and has 65 watts of pc light. amm 0, nitrite 0, nitrate 0, cal 370, alk normal range. I supplement weekly with 2 part calcium, iodine and iron. The only potential problem I foresee is that the ecosystem design has a very weak current. << That isn't ideal, but lighting is a big issue. >> Will this coral survive in these conditions? I am also feeding it daily with zooplankton, Cyclop-eeze and Sweetwater plankton. Are those foods good? Any other things I need to be aware of? << Good foods, I'd just put it wherever you have the most amount of light. >> thanks, Angela << Blundell >> Torch or Candy Cane coral Hello Crew, Another day in this excellent hobby. Another day to worry about things huh? Quick question. Do Candy Cane corals recover from damage? I have a cluster with 9 polyps but recently I was on vacation for 3 days and one of my triggers damaged 3 of the polyps (1 now has tissue only in the middle - and the other 2 were partially bitten). Will they grow the stony part back (assuming they will not get damaged again? I made the mistake and left the lights on every day and the trigger, which was left unfed, turned against it. I have previously left my fish unfed for a weekend or so but with no incident. I've had this coral for a year. I am adding iodine/calcium/trace elements as per direction. I can see the tissue on the coral trying to connect but I'm not sure if the stony part will grow back? >>The coral should recover and the stony part may or may not grow back. The important part is to make sure there is no further damage. Are you testing for iodine and calcium and other trace elements? A good rule of thumb is to only add what you can test for because otherwise you can easily be overdosing or just wasting money. I am not a big fan of adding anything other than a two part Ca solution regularly, and with regular water changes your trace element levels should stay at the correct level. Rich>> Keep up the good job - I always consult your site when in doubt. It is an excellent source for reference. Have a nice day.